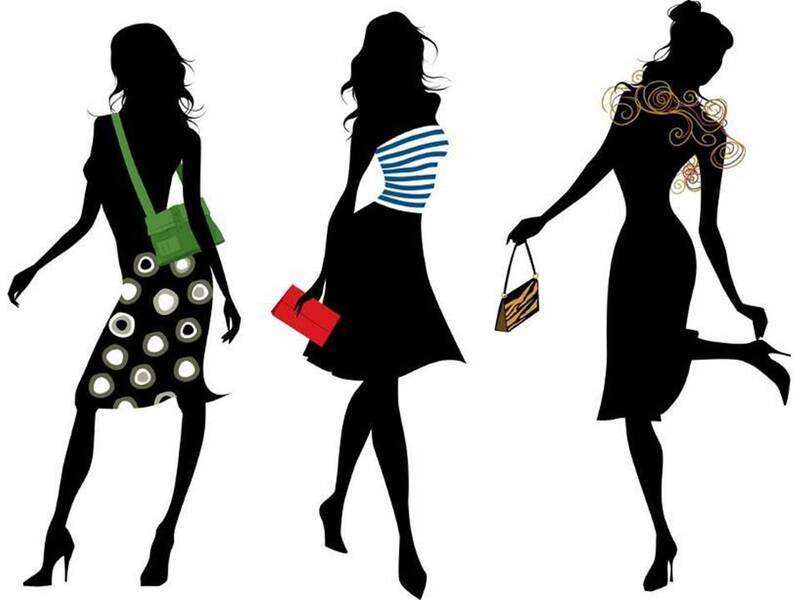 If you are planning to attend the fashion show and buy raffle tickets, we recommend that you bring address labels to make things go faster. You must be present to win a raffle basket so if you forget your labels, you can just write your name on the ticket. We also have 5 items for a Silent Auction. Credit cards will be accepted for those. All those who signed up to help with registration or raffle ticket sales are asked to check in with Nancy Jacobs in the lobby at 9:30 a.m. on February 12. Models not eating prior to the fashion show are asked to be at Madera by noon. If something has come up, and you are unable to help on the 12th, please let Nancy know ASAP at 970-946-3910 or nancyajacobs@yahoo.com. 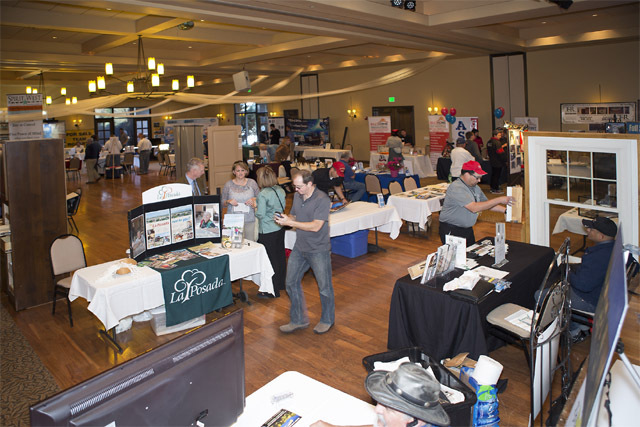 The annual business expo, sponsored by the QC Ballroom Dance Club, will showcase over 100 local businesses and nonprofit organizations. These include home improvement, insurance and legal/financial services, specialty equipment such as golf carts, and volunteer opportunities. The Continental School District Educational Foundation (CSDEF) is holding a Sweet Art Gala on Saturday, February 13 from 5:30-8:30 p.m. at the Community Performing Arts Center, 1250 West Continental Road. Anza Trail School is having a huge event, Coyote Country, on Friday, February 19 from 5-8 p.m. to raise money for four outdoor classrooms for kids grades K-8. The outdoor learning areas will be invaluable to the teachers and students. The school is currently the largest in the area with 1,400 plus students. It is located at 15490 S Rancho Sahuarita Blvd. Live music, food, games, and prizes. Admission fee: $5. For more information contact, Anza PTO, anzapto@gmail.com. There are only a few seats available! Tickets are $40 and include bus transportation, lunch and a “behind the scenes” tour! Currently this trip is only open to members. If there are seats left after the February 29 meeting they will be offered to Quail Creek guests at $45 each. You may contact Nancy Wilson with questions at nanwil60@aol.com. Coming Soon! The “Big Baby Bottles” will also be available at the General Membership meeting on the 29th. Be sure to bring your donations and look for the collection table at the back of the room. Contact Pamela Rodgers with any questions at 520-561-7969 or prodgersaz@gmail.com. Donations may also be dropped off at her home, 2640 E Sawyer Road (drop box on front porch) or call she will be glad to pick them up in the Quail Creek/Green Valley area. WHAT’S NEW ON THE WEBSITE THIS WEEK! The latest addition to the website is the Milestone feature in the sidebar (on the left of the screen). This feature displays a countdown to a certain date. When the event falls within the current month, the countdown will change to “how many days are left” to a milestone (or event, in our case). This feature will be removed when not in use, and re-added when appropriate and as needed. 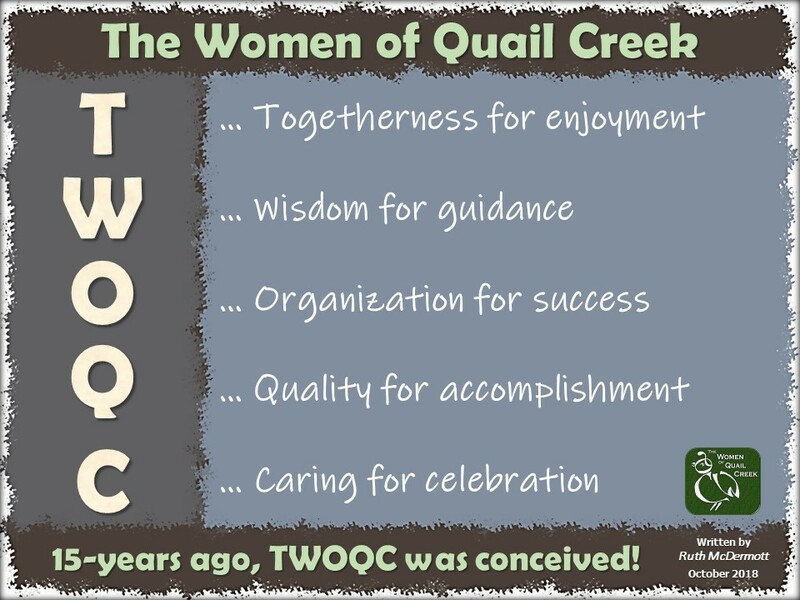 Follow us on social media: TWOQC on Facebook!